I think a lot of us can relate to Kelly’s sentiment. My addiction to beading is all because of my mom. (Thanks, mom!) Around Mother’s Day, I like to spend some time thinking of how the women in my life influenced me. Grandmothers all seem to have that container of beads in common. Nowadays, there are a lot of ideas for how to organize and store your beads inexpensively or for free. My grandmother’s bead and button stash lived in a re-used Royal Dansk cookie tin. I sat at her Formica dining table and rifled through that tin, because there wasn’t a whole lot for a 90s kid to do at my grandparents’ house. Like many grandmothers, mine was super thrifty. That’s why she kept that cookie tin full of beads and buttons. (And a basement shelf full of canned food she got on sale that ranged from nearly expired to “I hope that’s not for dinner!”) I think I inherited a lot of my grandmother’s thrift and frugality, as well as her inclination toward reading and writing. However, she wasn’t nearly so plagued by such frivolities as the desire to make physical art, like I am. If you’re a thrifty deal-seeker, the sale price of Explorations in Beadweaving will appeal to you! As far as artistic creativity goes, I believe my mother has been the biggest influence on me. Many of the projects in this book remind me of hobbies she enjoys, such as gardening, birdwatching, and antiquing. Mother’s Day is coming up, so let’s explore some of the projects in this book to see if they inspire you to make something for the maternal influences in your life! A woven bracelet loaded with floral motifs is just right for the gardening gal. 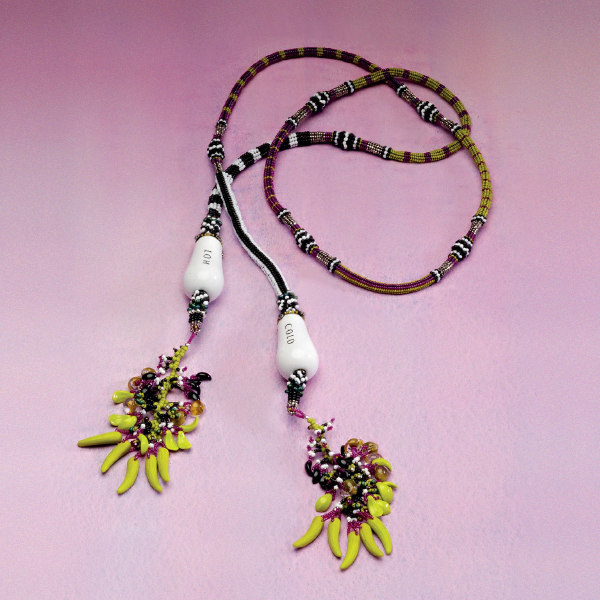 The Fiesta Bracelet pays homage to something a lot of mothers and grandmothers enjoy: gardening. My mother is a wonderful gardener, embracing the wildness of nature, celebrating and encouraging native species, and creating habitats for the birds and fauna of southern Wisconsin. I had my wedding reception in her garden; even though it was October, the garden was lush, almost tropical feeling, and full of colors and textures like this bracelet. 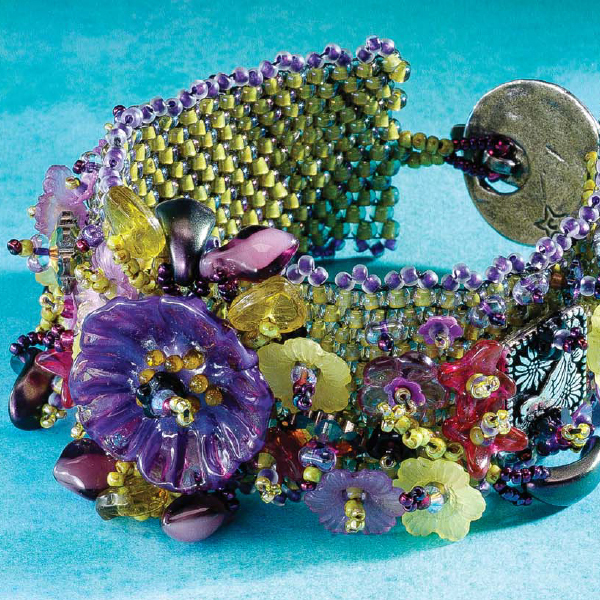 You can create this garden of beads with colors and components that remind you of your flower- or garden-loving mom. If she’s not into the chaotic beauty of a wild garden, or if you prefer a more geometric, groomed, English-style garden, check out this geometric floral bracelet as an alternative for the garden-loving lady in your life. Poetry and birdwatching collide in this lovely raven-themed necklace. This necklace, called Silence Unbroken, evokes a woodsy, mysterious feeling that would appeal to any earthy lady. The warm colors and natural textures remind me of the many hikes I’ve taken with my mom through prairies and forests. Unfortunately, there are no ravens where I live — but I, too, have always felt a certain affinity for these intelligent and intriguing members of the corvid family. Whether it comes from my mother’s collection of Edgar Allen Poe or her hobby of birdwatching, I don’t know! If you and your mom love birds and jewelry, check out this book full of bird and butterfly designs. There are 12 patterns inside that each feature step-by-step directions. Even the newest fledgling beader will have no trouble creating lovely beaded jewelry. 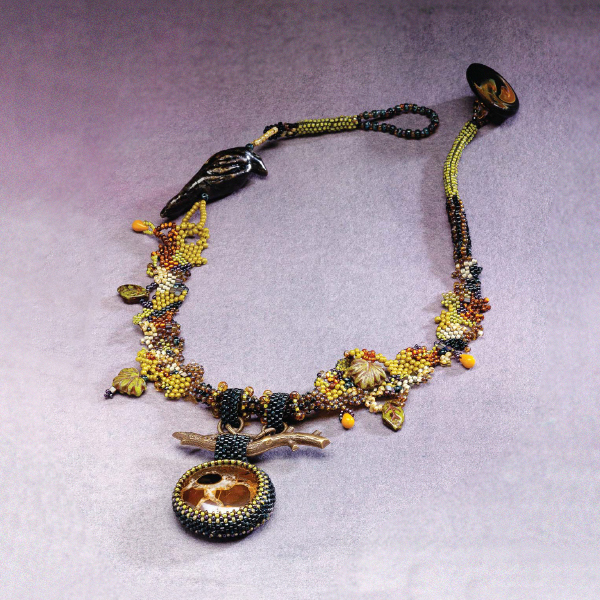 Create one-of-a-kind jewelry from objects discovered at antique stores and the like. One thing that runs through all of the ladies in my family is a love of shopping! We enjoy visiting antique stores, garage sales, thrift stores, and flea markets. We’re always searching for a bargain on something really useful or interesting. 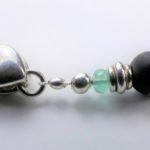 The Everything but the Kitchen Sink Lariat is a prime example of the amazing stuff you can create with found objects. I have several trinkets and ephemera purchased on shopping trips with my mom and sister that are just waiting for the right spark of inspiration. 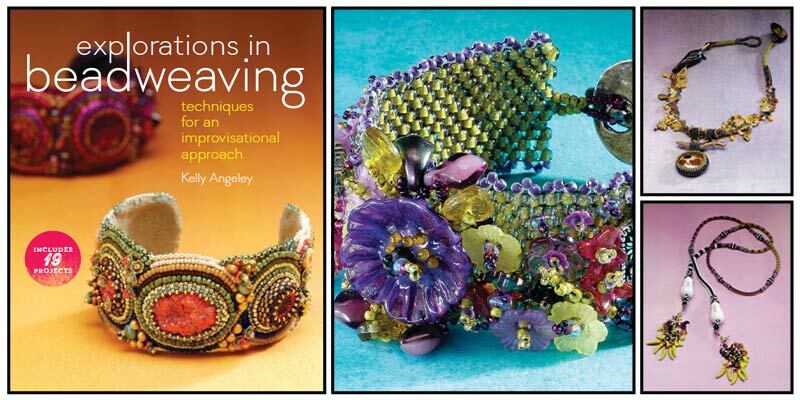 This book on using bead embroidery with found objects is a great resource for finding ideas for what to create with your treasures. We owe a certain amount of gratitude to all of our ancestors, because without them we wouldn’t be who we are. But there’s a special bond between grandmothers, mothers, daughters, sisters, aunts, and nieces. What hobbies or interests do you have that you can attribute to your mom or other women in your life? Please leave a comment below. Featured Image: Get inspired to make something for Mother’s Day with the creative projects in this book. Find some beading projects that would make your mother proud!